If you have kids, I’m pretty sure you know who the “Chompys” are. For those of you who are fortunate enough not to know, they are the baddies from the massively popular video game, Skylanders. Disclaimer here: I am neither a Skylanders fan nor a video game fan, but I’m outnumbered by the men in the house who think games are pretty cool. Deciding to choose my battles wisely, I caved on this one and allowed games into the house… but with rules attached. You can play on the weekends only, for no more than an hour and only if you behave nicely while you do it.The rules have been working pretty well, until this past weekend. The boys found themselves exploring a new section of Skylanders and found a “chompy pit.” Think Gladiator-lite: you battle these cartoon thingys and do it as a team. Well, Boy #1 charged into the chompy pit using his super belch (not kidding) to drive the chompys away. Boy #2 had another idea. He was not up for the grand battle, but instead wanted to find jewels, move rocks and do other smaller tasks… earning more life force and strengthening his player. But Skylanders is clever. The game warns you when you are too far from the other player, and eventually if you don’t head in the same direction, you just get stuck: pulling against each other and going nowhere. The volume in the house went up, and everything descended into madness. General Mom declares the game is over, and now both boys are wailing over the lost opportunity. Watching them face the chompys reminded me of teams in the work place. Like many of you, I’ve been fortunate to work with passionate, goal driven people who want to make a difference in the world. We have our eyes on the same goal. We just have different ideas about what path to take to get there. So everyone knows the corporate goal. They’re fired up and onboard. But what’s the best way to get there? When you have a lot of talent in the room, finding consensus on the tactics or the path can be tough. There are a lot of great tried and true ideas that are proven. You know that they work, that they generate results and the team knows how to execute them. Just like Boy # 1 who charged straight into the fray using the moves (ye olde super belch) he knew worked, the team can achieve its goal. There are also new ways to get to your goal, new technology, new metrics. Perhaps they’re unexplored or undefined. They’ve worked elsewhere and may work for you, and you want to understand and test them, taking your time to plan, prepare and then execute. So you do A/B testing, focus groups and research. You’re finding more jewels, earning more life force and strengthening the plan, preparing yourself and then getting to the goal. Now, your smart, passionate team is struggling internally. Some head one way, wanting to stick with what’s known. Others want to prepare. And the entire team gets stuck, pulling against each other and not marching towards the goal. So what’s the better way? Rely on the way we’ve always done it? Or go Blue Ocean, monitor, measure and then move forward? Neither. Both plans work. It’s not about how you get there, but instead it’s about building consensus and doing it as a team. As leaders, it’s our job to bring people together, to foster collaboration and open communication, to paint a compelling vision and then find a win-win solution that everyone buys into and commits wholeheartedly to. Great ideas will come from a great group of people. A leader demonstrates how the great ideas fit into the goal, and then helps the team focus and prioritize so they make the right decision each time. 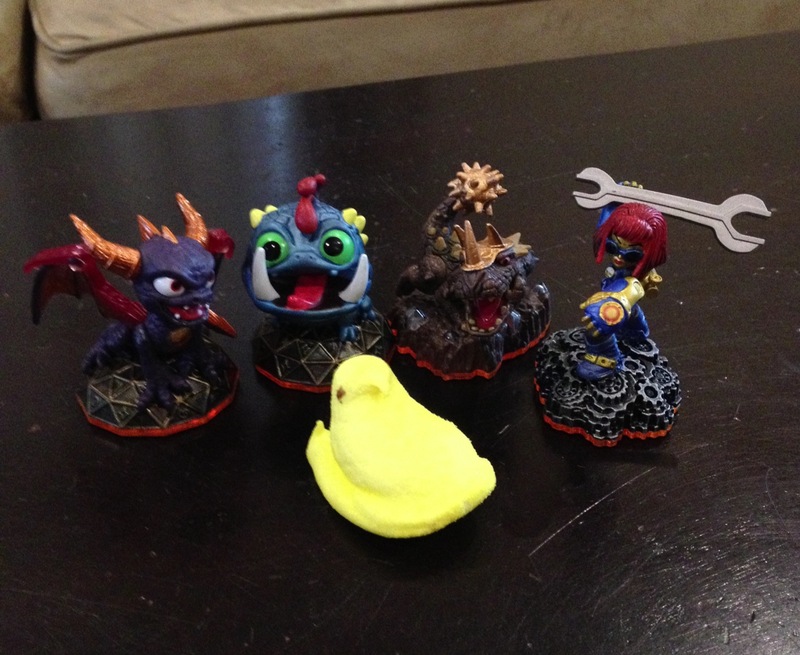 So back to the Skylanders. After my “Command and Control” leadership debacle, we decided to try again the next weekend. Boys 1 & 2 came to battle again. We paused the game, talked about what came next with me guiding the discussion, and they agreed on the way to win that was right for them. Score 1 for the boys. How will you help your team fight the Chompys? P.S. Major respect to any of you that can tell me which character in the picture has the Super Belch. It is pretty effective! Tags: Business, Collaboration, Focus, Goals, Leadership, Priorities, Skylander, Teamwork | Permalink.